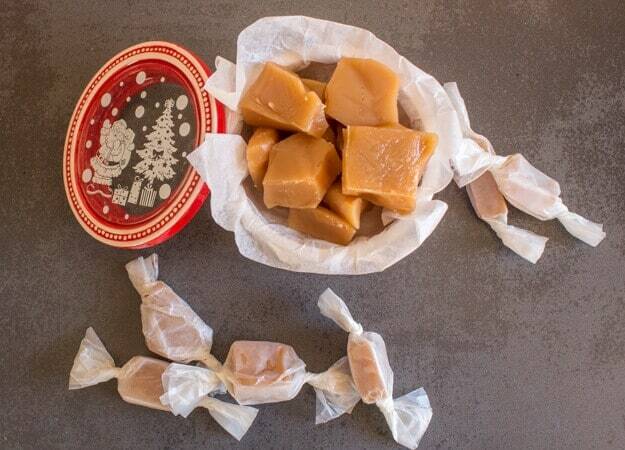 Creamy Old Fashioned Caramel Candies, the best creamiest five ingredient Caramel Candy. Perfect plain or dipped in chocolate. I love to bake and I love to cook but making candy has always been something I really didn’t do much of. Yes I did make Sponge Toffee and Fudge. But not a creamy candy. This year I decided I really wanted to make one of those old fashioned Homemade types of candies that needs a candy thermometer. Little did I know that it would take longer than I expected. More of that non stop stirring. But I have to tell you, the end result was perfect. 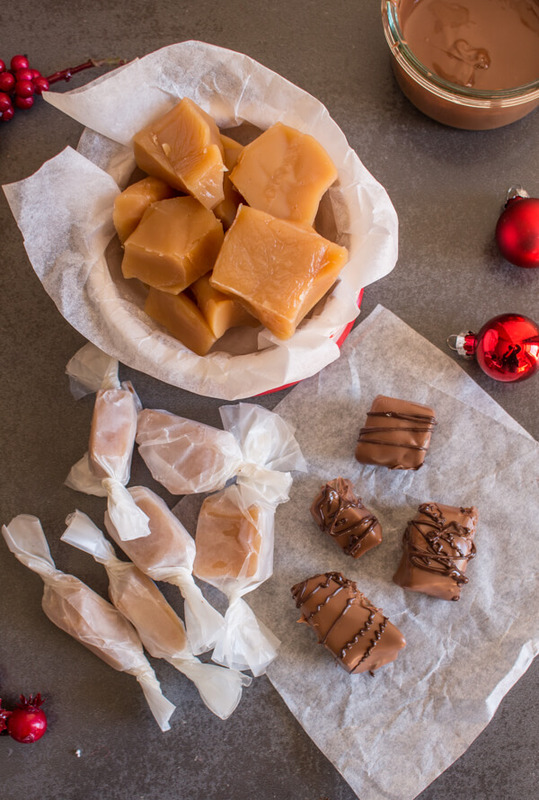 There is nothing better than Creamy Old Fashioned Caramel Candies. I found the recipe in a collection I received from a friend’s mother. The same collection where I found the Lemon Thumbprint Cookies. I didn’t want the fast and easy way out, I wanted an old fashioned caramel like my grandmother made. And yes this is it. Again it is one of the pretty easy recipes that all that is required is time, and oh yeah stirring! Five ingredients and you have the creamiest caramel you will ever eat. After I made these Caramel Candies my daughter asked me what they were as she popped another one in her mouth, and I told her “Toffee” and then I said “no caramel oh it doesn’t matter it’s the same thing”. And then I thought “are they really”? 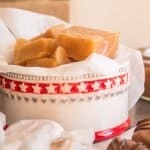 What is the difference between toffee and caramel? 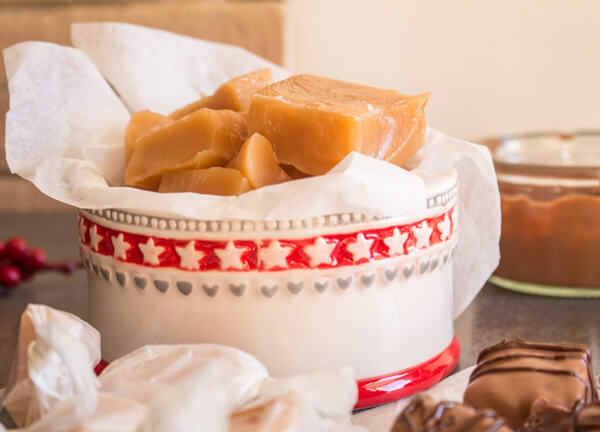 Well caramel is made with sugar, cream (or milk, I used cream) and butter and is heated to a temperature of 248° F, whereas Toffee is made with sugar and butter and is heated to 300°F to make it crunchy (maybe next year)! 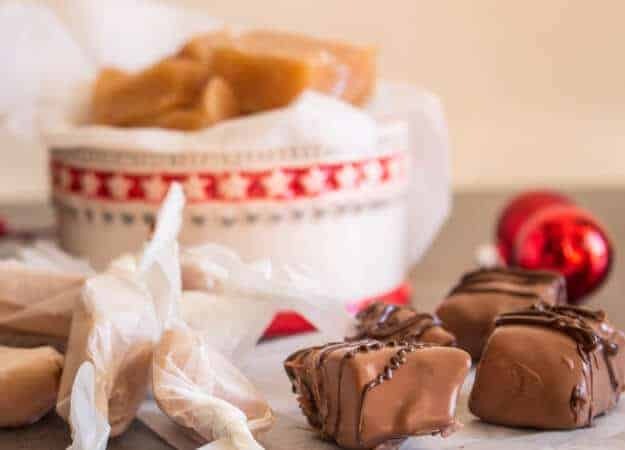 Creamy Old Fashioned Homemade Caramel Candies are delicious whether you dip them in chocolate or eat them plain. 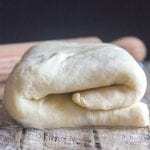 Wrap them in waxed paper then put them in a fancy tin and they become the perfect gift. Enjoy! In a medium non stick pot add sugar and corn syrup, butter and 1/2 cup cream. Cook stirring (whisking) continuously until syrup has dissolved and boils. Slowly add remaining 1/2 cup cream, mixing continuously and continue on a slow boil,over low heat until mixture reaches 248° F (this takes a while so don't be impatient). Remove from heat add vanilla and stir to combine. 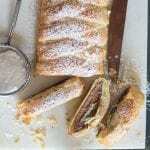 Immediately pour into a greased (buttered) baking pan 8x6 inches (21x16 centimeters). Let cool and then cut into squares (or you can let it get hard and just break into pieces). Enjoy! Dip pieces in melted chocolate or wrap in waxed paper. 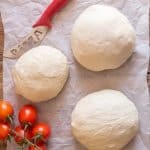 I made this recipe with some modifications to reduce sugar. 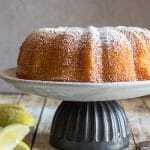 Instead of 1 cup sugar, I did 1/2cup coconut sugar,1/4 cup xylitol , 1/4 cup sugar. Instead of 1/4 cup & 2 tblsp corn syrup, I used 1/4 cup agave nectar & 2 tblsp corn syrup. Also added a pinch of salt at the end. Turned out great so I thought I would share. Hi Linda, thanks for sharing the substitutions, and glad you like the candy. Have a great week. Love this, Rosemary! Hope you have a wonderful Christmas ?